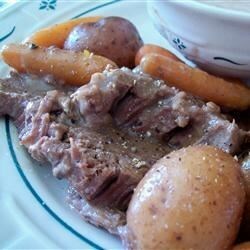 "This roast is made in the slow cooker with the potatoes and carrots. Very easy and delicious." Season roast with black pepper and garlic powder. In a large pot, heat the oil over medium heat. Brown the roast on all sides for 20 minutes. Mix together the mushroom soup and the onion soup mix in the slow cooker. Place roast into the slow cooker, and arrange carrots and potatoes around the meat. Cover, and cook on low for 6 to 8 hours, stirring occasionally. What's cooking in Polson? This impressive lamb dish. We loved this-be sure to use a 5qt or larger crock pot for this one.